Options are available to get this PC with Windows 10 pre-installed, including drivers. Please check your selection above. The Fierce SAVAGE Desktop Gaming PC is amazingly fast! It features the powerful new AMD A-Series A8-7650K Quad Core Processor/CPU, running at a lightning 4.2GHz. Match this with a massive 16GB of 1600MHz RAM/Memory and you’ll get performance you’ve only dreamed of before. You’ll have your friends barely keeping up thanks to the power of AMD R7 Series Graphics. And when you want to play online, you’re ready with super-fast 300Mbps WiFi! This PC is fast, reliable and will easily cope with all your day to day tasks such as web browsing, email and Office. You can sit back, relax and watch all your favourite movies in high definition on your HD monitor or TV. This PC also includes one of our great LED-backlit gaming keyboard and mouse kits! 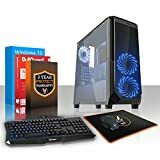 This entry was posted in Computer Desktops and tagged 16Gb, 218829, 4.2GHz, Black, Blue, Computer, Core, Desktop, Drive, Family, FAST, Force, Gaming, Graphics, Hard, Home, Keyboard, Mouse, Office, Quad, Radeon, Series, ULTRA, Windows by Express Computer Supplies. Bookmark the permalink.